addition scenarios with general layouts, price ranges and estimated completion times. This general information should be helpful in deciding what you wish to do in your home. Please note that these are general examples only and that each project must be judged on an individual basis. Your particular plan will be created especially for your home to meet your specific needs and taste. 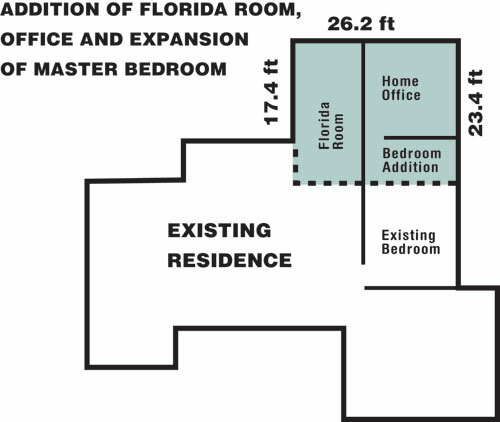 Project: Addition of Florida Room, Office and Master Bedroom Expansion. Total Addition: 613 sq. ft.
and bath, and walk-in closet. Design Hosted by Cyberian Management Group ©2006. All rights reserved.